Olympia, Wash. — Many children want treehouses in their backyard. 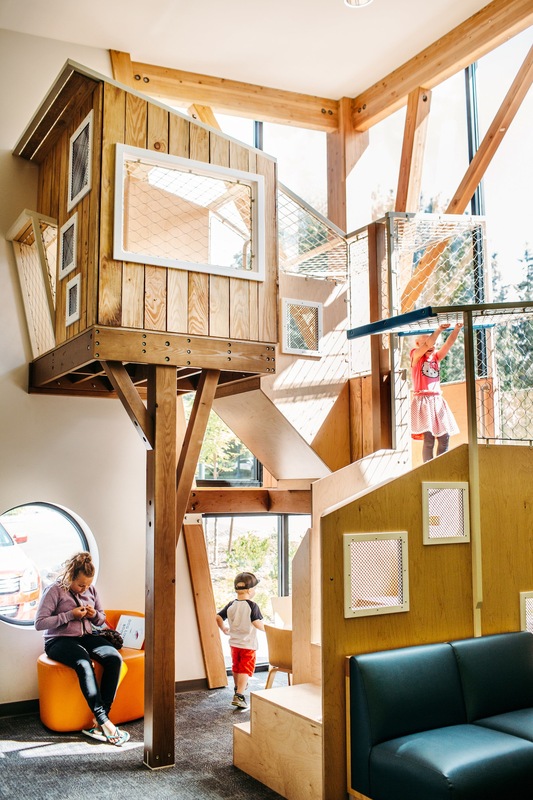 Most don’t think about treehouses in their dentists’ offices. 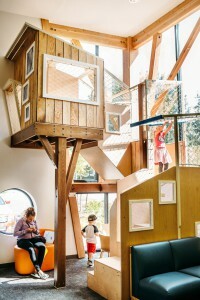 The young patients at Small to Tall Pediatric Dentistry in Olympia, Washington, are treated to a treehouse in the waiting room. It is one of the unique design elements of the practice, and because of those characteristics owners Drs. Benjamin Ruder and Scott Rowley were one of the winners of the 2016 Dental Office Design Competition sponsored by the ADA, ADA Business Resources and Wells Fargo Practice Finance. For dentists that have designed their own offices, the deadline for the 2017 Dental Office Design Competition is Aug. 21. All newly built offices and offices with improvements or renovations completed between Jan. 1, 2014 and Dec. 31, 2016 are eligible to enter the competition. All practice types are welcome. Only dentist-owned practices are eligible to enter. Dr. Ruder said the new practice location came after they had outgrown their old facility. He read a book on dental office design published by the ADA for initial ideas. In keeping with motifs associated with the Pacific Northwest, the new building, built from the ground up and finished in 2015, incorporates many images and the feeling of topiary around the building. The treehouse keeps with that theme. “We want to make the office inviting for children from the get-go.” It was inspired by the Hands On Children’s Museum of Olympia, he added. A lot of noise is what happens at Oakland Drive Pediatric Dentisty and Orthodontics in Portage, Michigan, a practice owned by the husband-and-wife team of orthodontist Dr. Thomas Kwong and pediatric dentist Dr. Chuandi Wang. They also were winners of the 2016 Dental Office Design Competition. The noise comes from high ceilings that create an echo – the only regret that Dr. Kwong cited when discussing the office, which was built from the ground up. Otherwise, he and his wife are very happy with their decision to build, necessitated because they needed more space to accommodate a growing dual office. The two specialists wanted to incorporate lots of color and circles into their new office, which they built in February 2015, and completed in September 2015. The circles were important to the couple, Dr. Kwong said, because he said much of traditional Chinese architecture avoids sharp edges. Even the door is rounded, he said. The Dental Office Design Competition recognizes dental facilities that most effectively express the practice philosophy of its practitioners and demonstrate a thoughtful assembly of design characteristics associated with an up-to-date dental facility. Outstanding Specialty Practice: Best new, remodeled or expanded facility for a specialty practice. Outstanding New Dentist Practice: Best new, remodeled or expanded facility for the first practice owned by a doctor or group of doctors who have graduated from dental school since 2007. For more information on past winners and contest entry, visit dentalofficedesigncompetition.com. This year’s winners will be announced in Atlanta at ADA 2017 – America’s Dental Meeting. Registration for the annual meeting is open at ADA.org/meeting. Wells Fargo Practice Finance is the only practice lender recommended by ADA Business Resources. Their dental specialists can be reached at 1-888.937.2321. “Building or Refreshing Your Dental Practice: A Guide to Dental Office Design” (P091) is available from the ADA Catalog. Readers can save 15 percent on the book and all ADA Catalog products by using promo code 17132 until Sept. 15. To order, visit adacatalog.org or call 1-800-947-4746. I had never thought of designing an office like that.